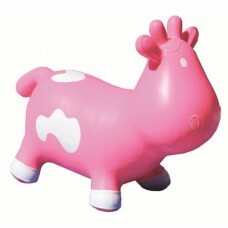 What child on the moo-ve wouldn't want a cow shaped space hopper? Available in bright and cheery colours, these funky hoppers will keep toddlers entertained for hours, both indoors and out. KidZZFarm Animal Hopper are attractively gift-boxed and come complete with pump, so they make the perfect gift for children. We guarantee all that bouncing will have even the most energetic toddler good and ready for bedtime!